One of the challenges of being in the benefits field is persuading people to take action. We want them to participate in an annual health risk assessment, exercise, get their children vaccinated, save for retirement . . . the list goes on and on. Watching the political conventions this summer reminded me of an important strategy when trying to persuade others to take action, not only in the political arena, but also regarding their benefits. During the conventions, did you notice the reaction the crowd gave little-known people who told personal stories about their lives? People got to their feet. They cheered. They cried. Crowd reaction to these individuals and their testimonials frequently trumped the reaction to other speakers—even well-known politicians—sharing cold, hard facts. Stories—especially when they are shared by the persons who are part of the story—are a powerful communication tool that’s typically underutilized when it comes to benefits. Stories are effective because they stick in our brains—statistics don’t. Experts tell us our ancestors didn’t have access to huge data sets; they learned from examples. Our minds aren’t primed to heed the advice embedded in numbers. Stories are persuasive because we tend to imagine ourselves in other people’s shoes. 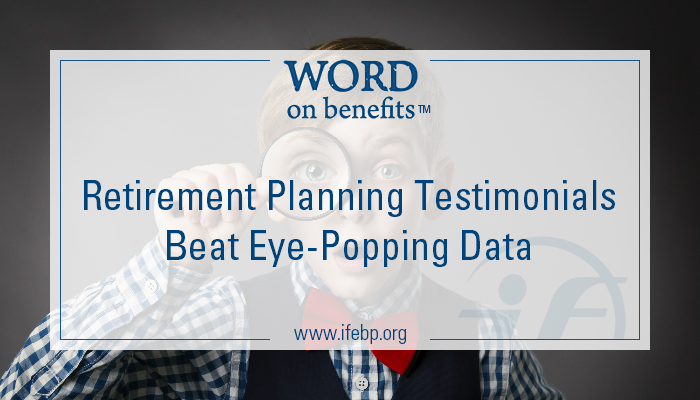 Download this new information sheet for tips on how testimonials and other strategies can help your organization boost the retirement security of your workers and plan participants: Ten Ways Behavioral Economics Can Boost Retirement Security.